Planning is the Productivity Piece of Maintenance! Other efforts in maintenance such as RCM, PM Optimization, PdM, and Project work dictate the “right” maintenance. But the resulting maintenance tasks sit as low priority work in the backlog without a productive maintenance workforce. Planning gets these jobs done. Most companies do not have a specific planning function and nearly all that do are frustrated. Many companies "plan" because they are "supposed to." They hire planners and declare victory. The planners are supposed to prepare plans identifying parts, tools, and instructions before craftspersons work jobs. The plans should eliminate delays and increase productivity. Yet, maintenance planning and scheduling should dramatically improve the productivity of maintenance. For example, a group of 30 maintenance technicians should be performing the work of 47 persons when aided by a single planner. Why are we doing P & S? Why is planning so frustrating? Why do we have to do scheduling? And finally: What if something breaks? What happens to planning and scheduling then? 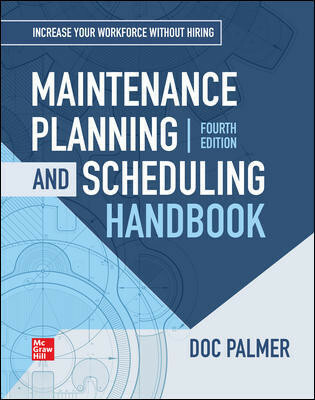 Doc Palmer and the Maintenance Planning and Scheduling Handbook answer these questions!